That F'ing Monkey: What kind of Ice Cream? Summer may be over, but here in Florida we haven’t really gotten much of a break from the heat yet. That means it is still prime ice cream weather. 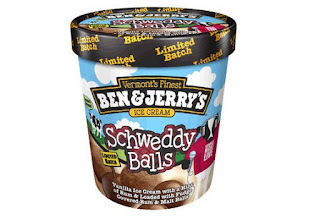 Ben & Jerry’s have been known for making different and pop cultured themed flavors before. Stephen Colbert’s Americone Dream is pretty much my favorite ice cream in store freezers right now. 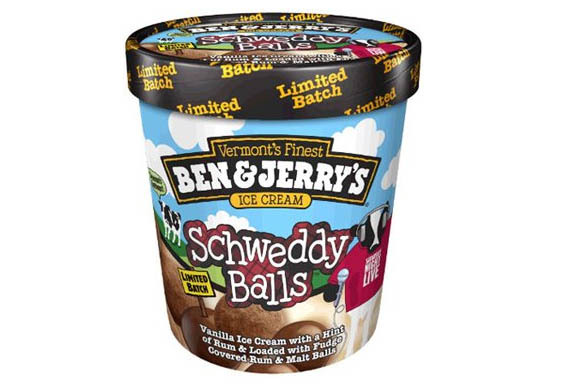 The ice cream makers have stepped up their game though and made something that I don’t think anyone could have expected, Schweddy Balls. Based on the Saturday Night Live sketch where Alec Baldwin is playing Pete Schweddy a guest on the NPR Show The Delicious Dish. Schweddy then goes on to talk about his rum balls and the Schweddy Ball jokes come rolling in. It is a classic and has been voted as one of the funnier bit of SNL history. So why not turn it into a “vanilla ice cream with a hint of rum & loaded with fudge covered rum & malt balls.” If that sounds like something you want in your mouth, grab it quick, because this is something that is only going to be around for a limited time. 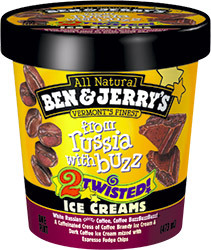 Personally I just wish they’d bring back from Russia with Buzz. The “cross of coffee ice cream with coffee liqueur & dark coffee ice cream mixed with espresso fudge chips” was my favorite ice cream ever.